XL Displays raises over £1,190 for Sue Ryder from 5K Inflatable Run! On March 24th 2018, a team of 26 of us from XL Displays took part in the 5K Inflatable Run at The East of England Arena and Events Center raising over £1,190 for Sue Ryder Thorpe Hall Hospice. The race saw our staff members complete a 5K course with 10 huge obstacles to negotiate along the way. Staff found the run to be challenging but also discovered it to be a great team building activity boasting miles of fun! Sue Ryder Thorpe Hall Hospice is our chosen charity for 2018 with a few members from #TeamXL having personal connections with the local hospice. Thorpe Hall Hospice is a fantastic local cause that we have been lucky to go and visit to see first-hand the amazing work that they do for our local community. Sue Ryder Thorpe Hall Hospice is the only specialist palliative care inpatient unit in Peterborough. The hospice contains 20 beds to provide patients with symptom management as part of their palliative care or for end of life care. 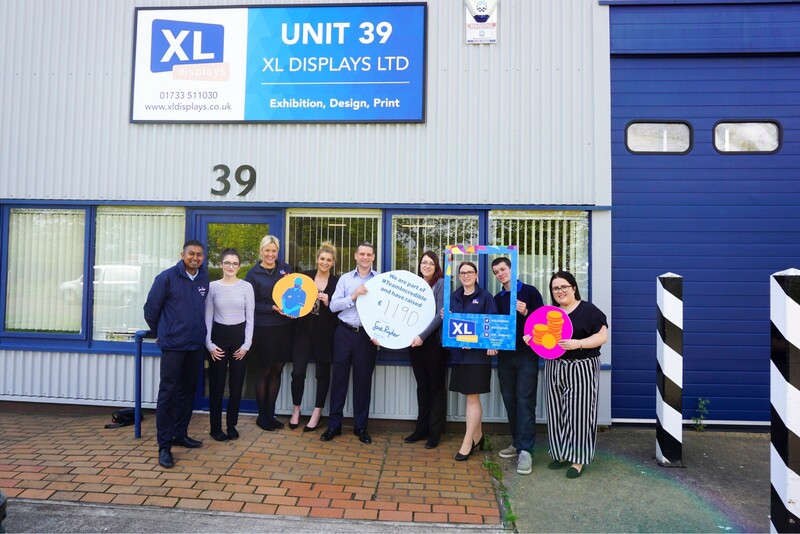 The team here at XL Displays always endeavour to raise as much money as possible for this great cause and over the past 2 years, we have raised over £5,300 for them. Fundraising and supporting both local and national causes has always been a big part of life here at XL Displays. Each year we set an end of year target to push ourselves to raise the most we can for a variety of different charities, 2017 was an extremely successful fundraising year for XL Displays and we managed to raise a staggering £4781 through a variety of different events. Staff members also donated a total figure of 1209 items to our local foodbank. To read more about our fundraising efforts in 2017, including a host of different events, read our article 2017 - A Successful Fundraising Year for XL Displays. This year, like every year here at XL Displays, we want to push ourselves to beat our previous year’s fundraising efforts. We have set ourselves a target of raising £6,000 for our chosen charity of the year Sue Ryder Thorpe Hall Hospice and donating 2,000 items to our local foodbank. Taking part in the Inflatable 5K and raising over £1,190 was a fantastic start on our pledge to raise £6,000 for Thorpe Hall Hospice this year. Of course, we have a whole host of different fundraising events planned for the rest of the year in an attempt to reach that all important target amount. For the next event in our fundraising endeavours, we recently announced participation in Peterborough Dragon Boat Festival in a launch day with Louis Smith. We decided to take the pledge and enter 2 teams into the annual Peterborough Festival this year – the ‘Nauty Oars’ and the ‘Anchor Buoys’. This local charity day takes place on 9th June at Peterborough Rowing Lake and presents a fun family day for all to watch up to 50 local teams take to the water to battle it out along a 200 metre course. It’s an extremely fun filled day with lots going on for all the family – an event well known to raise large amounts for charity. We are hoping to excel ourselves and beat last year’s biggest fundraisers in the event who raised a brilliant £3,500. Despite being the first year taking part, both of our teams are in full training and are very keen to take the number one place. We are all extremely competitive and at the Motorpoint Launch Day for Peterborough Dragon Boat Festival, staff from XL Displays urged other local companies to take on the challenge of trying to beat us. Taking part in the 5K Inflatable Run was a great warm up for our staff members who are also taking part in in the upcoming Dragon Boat Festival. We are extremely proud to have started off our fundraising year by raising over £1,190 for Sue Ryder through the 5K Inflatable Run, and we hope it’s set the benchmark for the rest of our fundraising events for the year! In addition to our fundraising for Sue Ryder Thorpe Hall Hospice, we are also doing quarterly collections for our local foodbank. This year, we are really ramping up our efforts donate the most amount of food we possibly can. Peterborough Food Bank is our local foodbank. It is a project that was founded by local churches and community groups aiming to work together to stop hunger in our local community. The need for a foodbank within Peterborough was identified back in 2012 during a tackling poverty workshop. At that time 1 in 4 children in Peterborough were thought to be living in poverty and as a result Peterborough Foodbank opened in October 2012 to help address this. Since opening in 2012, Peterborough Foodbank has given out 4,247 three-day food parcels to people in crises since 2015. We are extremely passionate about doing the best we can to contribute towards this brilliant local service. After visiting a local foodbank collection centre near to our head offices in Orton Southgate, our staff members are very aware of the brilliant impact the foodbank can have on those around us in their time of need. To kick off our first quarter of foodbank collections in the office, we decided to take a different approach and create an in house competition between departments to engage our staff further. Our latest YouTube video on Tips for Boosting Fundraising in a Business - XL Displays Foodbank Collection talks through our current internal competition for our foodbank collection and how we have created team collection boxes to enhance the competition and increase enthusiasm amongst staff. All teams have really got involved and the competition has brought out everyone’s competitive side with some teams even coming up with strategies in their attempt to win top spot on our leader board! We anticipate our new approach to our quarterly foodbank collection enables us to reach our 2,000 item target this year. As #TeamXL we are very excited about all of our upcoming fundraisers this year. Not only are they great fun and provide great team-building opportunities for everyone involved, it’s extremely rewarding for us to know all of our fundraising efforts are greatly appreciated by local charities and causes. We love giving back to our local community! For more information about our fundraising events for 2018 or if you would like to support us in raising money for Sue Ryder Thorpe Hall Hospice, please don’t hesitate to contact us or call us on 01733 511030.